(9 July 2018, Hong Kong) The Financial Dispute Resolution Centre (“FDRC”) today publishes its Annual Report 2017. In 2017, the FDRC has enhanced its financial dispute resolution scheme, which has been effective in phases from 1 January 2018 onwards. The FDCR continues to provides its quality service to resolve monetary disputes between financial institutions and their customers. 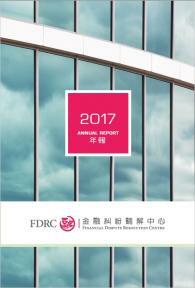 The Annual Report is now available for browsing via the following link: http://www.fdrc.org.hk/en/annualreport/2017/index.php. If public members would like to know more about our services, please call our hotline at 3199 5199 or visit our website at www.fdrc.org.hk.